There is wonderful source of old maps - three military mappings which took place in 18th and 19the century. 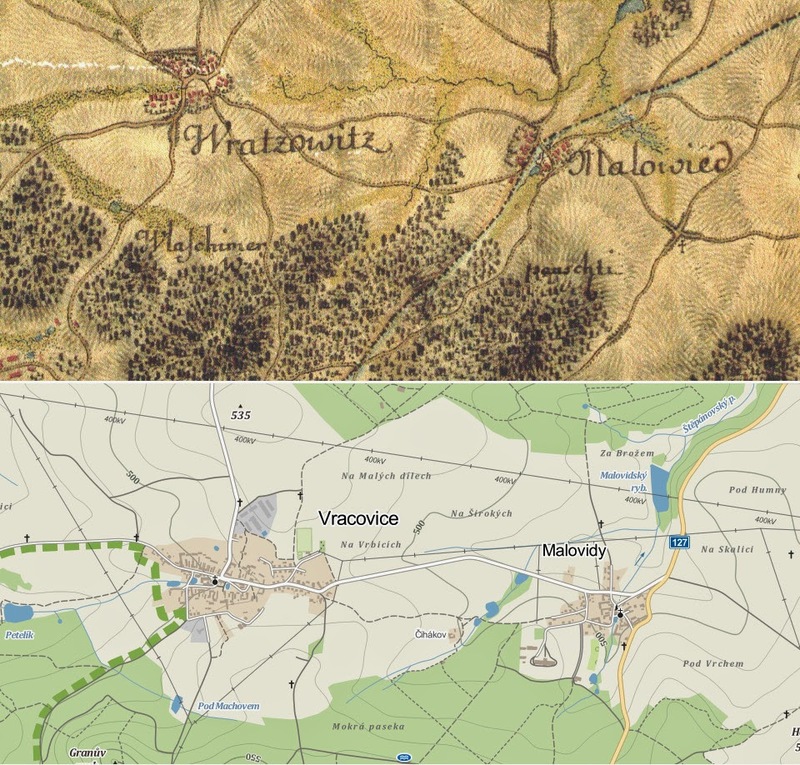 Whole Hapsburg empire was mapped and Czech maps are available online for those who are interested. And I believe many people are interested in old maps of regions where their ancestors lived. These maps have also on big advantage - the website they are placed on is available in Czech, German and English. I already mentioned them in one of the previous posts, but let's check them in detail. First military survey took place in two rounds - first between 1764 and 1768, second between 1780 and 1783. The country was mapped "a la vue" from the horse saddle - it means by sight, ie. soldiers who did this mapping were riding through the country and mapped it as they saw it. Therefor the mapping is not too precise, there are huge mistakes in some areas but it anyway gives wonderful overview of Bohemia, Moravia and Silesia at the end of 18th century. 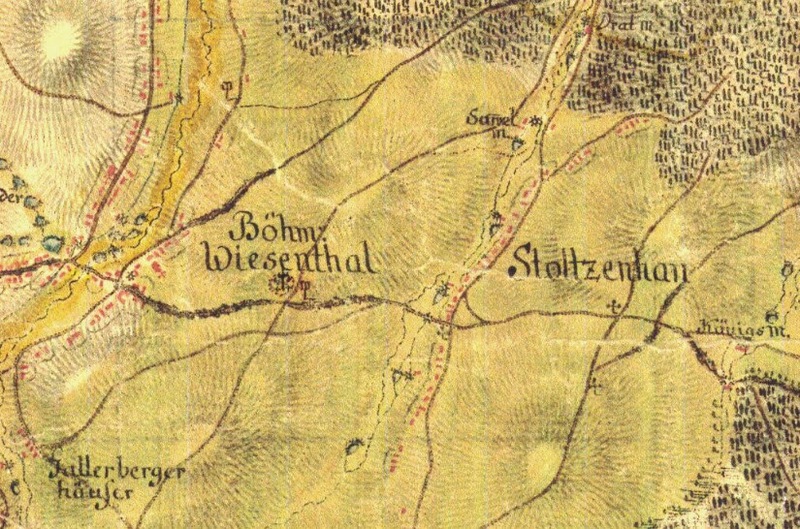 Loučná pod Klínovcem (Böhmisch Wiesenthal) and its surroundings, 1st military mapping. The maps were focused mainly to roads, rivers and creeks, mountains, villages and few kinds of specific buildings such as mills or churches. The country was divided to a number of map sheets, every done by another soldier. That the main reason why maps sometimes differ from each other even if they are adjoining each other. Vracovice and Malovidy (Benešov district) on old and current map. Second military survey was done between years 1836 and 1852. It was based on triangular net and cadastral maps of the Stabile Cadaster (which I plan to mention in one of the future posts) so it is much more precise than the first military survey. It gives us an idea about Czech lands in the half of 19th century - and there are many changes. There are less forests and more fields, villages and towns are larger, there are also first railroad tracks visible on those maps. 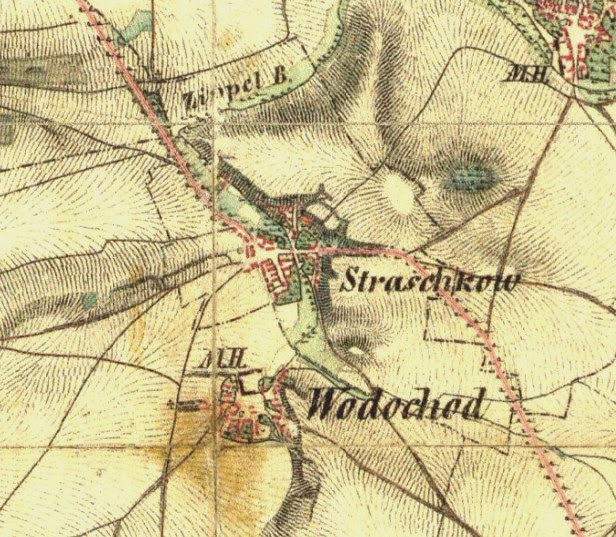 Straškov and Vodochody (Litoměřice district) on 2nd military mapping. Second military survey is also available on website Mapy.cz - and it has huge advantage because you can switch from current to historical map which is not possible in case of 1st military survey. And current descriptions are visible on the historical map too (can be switched off). You just have to choose the right layer in menu in the top left part of the screen to see the historical map. It will then show you historical map with current description included. But - these maps are not as detailed as those which are available on Oldmaps.Geolab.cz website which contains original maps. Historical layer of the map on Mapy.cz website. 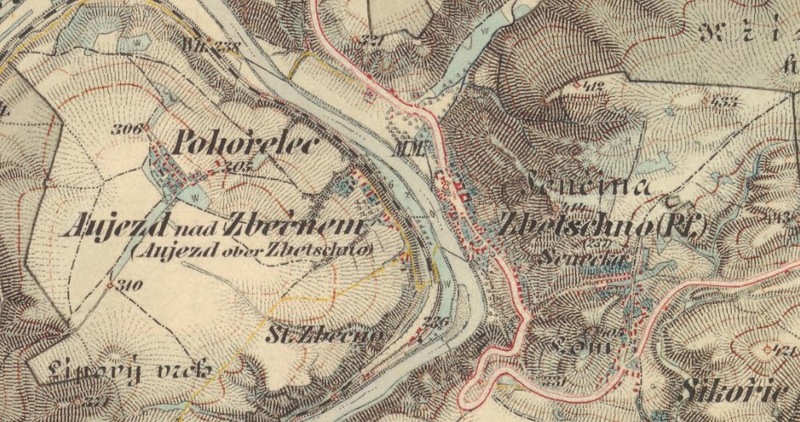 Last Hapsburg military survey took place in years 1876 to 1880. Those are updated maps from the second military survey and they are also based on the Stabile Cadaster maps. It contains more details important from the military point of view - such as heights, ground elevations etc. It is available in two scales, 1:25 000 (1 centimeter on the map is 250 meters in reality) and 1:75 000 (1 centimetes is 750 meters). These maps are really detailed and map the situation after quite quick development of the country after the half of 19th century. I can recommend using all three types of maps - it will provide you overview of the country in more than one century so you can see how the villages grew, forests disappeared etc.